It is recommended that all old style incandescent light bulbs are replaced with Compact Fluorescent Light (CFL) bulbs or LED bulbs to reduce electricity consumption. The light from an LED is very directional and so LED bulbs were only really suitable for spotlighting directly over work surfaces etc. These bulbs (of the type shown below) also tended to be quite dim compared to their halogen equivalents and so they were rather disappointing for general room lighting. BUT technology moves quickly, and at the time of updating this article (January 2013) these problems are history (as long as you choose the right bulbs to replace your existing incandescent/halogen bulbs). During the last 10-15 years, halogen spotlights have become more and more popular in British homes. 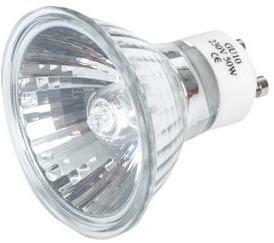 Halogen bulbs (pictured above) are typically available in low voltage 6V or more commonly 12V (MR16 fitting, supplied with a transformer) and mains voltage 240V (GU10) versions with 20-50 Watt power ratings. LED spotlight prices have tumbled recently so that they are not that much more expensive than thedichroic halogen bulbs that they replace. Halogens typically sell for £1 or more each – equivalent LED spotlights are now available from as little as £2 each, BUT whereas a halogen will last for around 1,000 hours on average and consume 35 or 50 Watts typically, an LED spotlight producing the equivalent amount of light will last for up to 50,000 hours with a total power consumption of only 3 Watts – 50 times the lifetime and one tenth the power consumption! LED Spotlights are now available with optical beam angles from 6 degrees (very directional spotlighting for reading lights or workbenches to 60+ degrees (for general lighting). They also come in industry standard fittings: MR16, and GU10 so you can very simply replace all the spotlight bulbs in your home and start saving on your electricity bill each month. 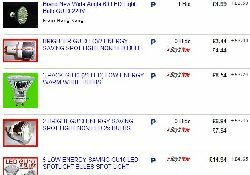 The cheapest places to purchase LED spotlights is still eBay. A huge range of different colours and light intensities are available from as little as £2.00 including postage. Click here to search eBay now for MR16 LED (12 VDC or 12 VAC), and here for GU10 LED (mains powered 110/240 VAC). Click here to find out more about Cree LED spotlights which are spotlights made up of one or more 1+ Watt LEDs, here to find out about dimmable LED and CFL spotlights, here for our review of Megaman dimmerable CFL spotlight bulbs, or here for information on remote control colour change LED spotlights. 12 Volt LED Spotlights are being used more and more in off-grid renewable energy situations where an array of solar panels, or a wind turbine, is charging a 12 volt battery bank with power. Using 12 volt appliances, devices, and lighting costs a little more up front, but there are no energy losses caused by having to step up voltage to 240V AC using an inefficient power inverter if you use 12 volts throughout. A typical power inverter burns up around 50 Watts of power just converting DC from the batteries to AC – enough power to light fifty 12 volt LED spotlights. nb. This only works well if the battery bank is close to the site where you intend to use the stored power or there are voltage losses over the cables. Click here to read about how to set up Shed and Garage Solar Lighting with 12V LED spotlights. 12V LED spotlights (pictured above) and MR16 ceramic bulb holders are available from the REUK Shop. I have been trying various combinations of batteries,12 volt bulbs, low energy lamps, LED lamps and LED strips over the past couple of years now. The normal 12 volt lights found in caravans and the like are OK, but they do drain the battery quite quickly. Low energy lamps take a while to warm up, they are not as bright, but do use less power thus extending the time between charges for the battery. By far and away the best are the new LED products coming along. We now have 12 volt LED strips as down lighting under the wall units in the kitchen, we have just fitted two LED candle bulbs in the cooker hood, a 12 volt LED table lamp and a 220 volt LED standard lamp (Bought by mistake – I thought it was a 12 volt!) in the lounge and more LED strips illuminating the stairs and hallways. These come to full power instantly and use so little power we can leave them on all evening without any thoughts to the consunption. I have tried the ‘bright’ and ‘warmlight’ LED strips and think they each a have a place in the home depending on what you are trying to light up. 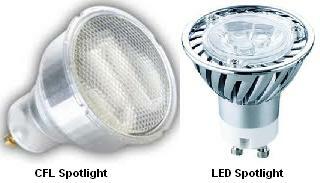 The LED bulbs come in a variety of fittings and have mains as well as 12 volt. Comparing the prices to your earlier articles show just how much they have come down and the range available today.